How often do you grind? Discussion in 'Vaporization Discussion' started by WarpaintFree, May 13, 2017. I think for some folks (excluding the analytical approachers) its sensitivity on the taste and effect thing. Some folks powers of observation are so acute that slight variations are noticeable but to others not so much. Like Diggy's dog, it hears and reacts to the grinder sound but not his people. I agree, some of us have a much more sensitive nose (and tastebuds) than others. I can quite easily detect the olfactory difference between something I ground yesterday and something I'm grinding right now. I grow my own, so I know the relationship, as I am the said person. That doesn't effect how much I need to grow to switch entirely to concentrates. My comment was about growing plants, not plates. As in, I wonder how many plants I would have to grow to switch entirely to concentrates. It's a math thing, not a who you know thing. @arb, I'm loving my 7th Floor grinder, but it's huge. You must have large hands. Still, I keep it nearby. If my Other Son shows up, I can throw it at his head. It's pretty substantial. I was hating using a grinder for awhile, but that passed, and life is good again. howie105, C No Ego and Squiby like this. I'm not sure how I wound up in this thread, but I just read it because this is a topic that is a friendly point of contention with a friend of mine. For context, he is a fierce advocate of never grinding at all and using careful storage, while I've committed every sin known to stoners concerning grinding and storage. I maintain that the difference is (for the most part) meaningless. The other variables in the equation are much more influential than these. Since taking up vaping I've been fortunate enough to be involved in a lot of testing. This meant that I had to develop protocols to control as many variables as possible. Turns out that there's a fuckuvalot of them, and some of them can't be controlled. For example, one of these is context: when and where you do it, and what is your state of mind. Because we're dealing with a psychoactive, all of these are important. Your perception of flavour can vary depending on your sinus condition, the other odours in the room, and what you've tasted recently. Directly to the point, the load you use is constantly changing because even if you use the same strain with the same moisture content and handle it exactly the same every time, it's unlikely that you're perfectly consistent with load size and density. Using ground buds helps here because it homogenizes the material, whereas whole buds can come from different parts of the plant or another plant entirely. Then there are the problems of consistent draw, consistent temperature, and consistent vapourizer conditions such as battery strength and whether the heat source is already warm. Don't even get me started on butane heat sources. There's more, but I think I've made my point. Obviously some of these things matter more than others; however, from session to session the predominance of one over another can and likely will change. If you believe that grinding and storage are always the most influential factors, I won't try to persuade you otherwise although I disagree. I just thought I'd point out the difficulties involved in judging the performance of something that we know alters your perception, and in fact many use it precisely for that reason. Chicken Charlie, Ramahs, C No Ego and 7 others like this. Excellent post, @pakalolo, full of many good points. It's nice to have benefit of your experience. Thank you. Whisper and Summer like this. @pakalolo Makes sense to me. Ok, so I tried scissors instead of grinding. It was fine, but it reminded me too much of trimming. I've got a silicone grinder, called Chube. It's ok. Not real consistent, as some stuff gets practically powdered, and some not, but I suspect it's user error and will try again. You don't like all those hours of snipping, hanging and cleaning? Of course I did, @howie105 ! Who doesn't? Just not enough to revisit the memories every time I vape. I prefer to keep it a once a year treat. It's more special that way. macbill, howie105 and Squiby like this. When I vaped and occasionally vape flower I prepare small batches for a few days, drying out a little helps the vaporization compared to moister stuff, that sweet spot appears to be after a day of exposure or so. Whisper and Madri-Gal like this. 90% of my vaping is done using dosing capsules in my Crafty and Fury 2, the balance in my VapCaps. I keep my herbs in small mason jars with bovedas. I usually like to do my grinding and filling of all the dosing caps in one sitting. Typically I grind enough for 12 or so S&B caps and a similar number of Fury caps and some left over stored in Doob tubes for my VC and special trichome loads. The loaded caps are stored for the Fury 2 in small sealed centrifuge tubes and for the Crafty in the small S&Bs gasketed metal tubes. So essentially I'm grinding and filling once every ten days to two weeks. I grind every time I hit the dance floor, baby! John Coaltrain, macbill, guyonthecouch and 3 others like this. grind, when rolling, packing a vape or gonna get high that moment, i like to store buds in glass... 4pieces grinders for the win! I store the product I buy (typically 3.5 grams per strain) in 125 ml mason jars with a 4 gram (small) 62% boveda per jar. I use a 4 piece grinder to grind the weed just before a vaping session. Storing, grinding, vaping, cleaning the bong with dish washing soap right after use has become some sort of ritual for me. Reading your advice, from now on I'll grind too! Logic, pxl_jockey, TiSteamo and 1 other person like this. 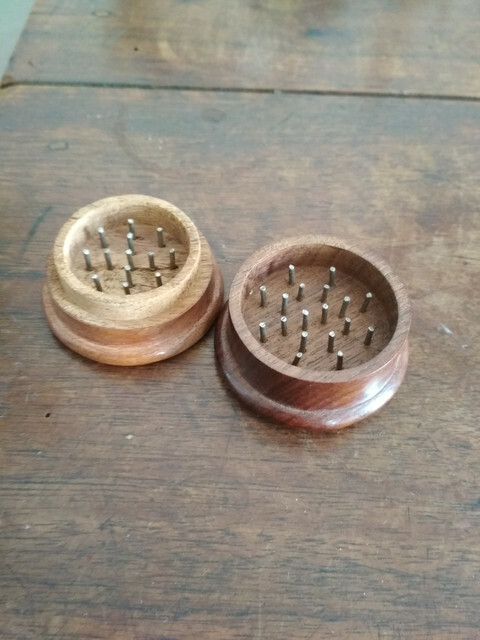 I found a beautiful wooden grinder , a friend of mine bought it at Phi Phi Islands, Thailand. 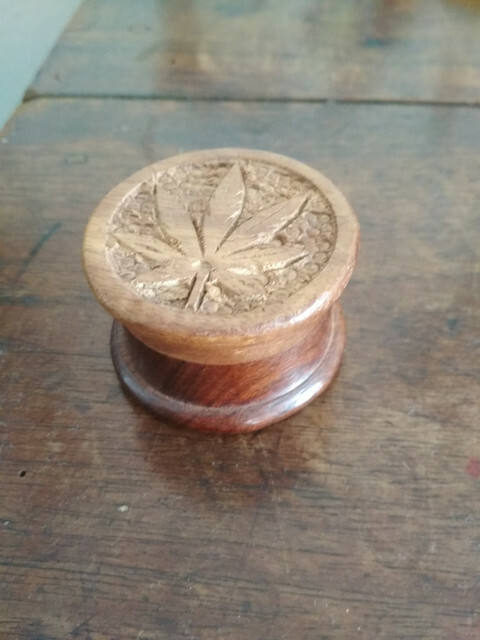 It is made of wood, handmade, with iron teeth and a marijuana leaf is engraved on the lid. Very beautiful! Logic and ilsasta like this. I only grind up what I’m going to be using during that particular session, in order to preserve bud quality/structure, freshness, and taste. It just makes sense to me! ilsasta, TiSteamo and Madri-Gal like this. You know now we want a pic? TiSteamo, Logic and Madri-Gal like this. ilsasta and Logic like this.